I just finished the book, Man’s Search for Meaning, by Viktor Frankl an Austrian psychologist who lived through the Holocaust as a prisoner in several concentration camps. As a Jewish prisoner, who every day would wonder if he would live or die that day, he observed how people managed themselves. He found a trend that differentiated those who survived the experience and those who died. Although there was a lot of arbitrariness in it all, he discovered that prisoners who had a meaning or purpose in their life tended to make it. Those who gave up and decided that life no longer had any meaning, generally were the ones who would get sick and would either die of the illness or be sent for extermination because they were no longer useful to the camp. In his theory of logotherapy, he determined that one can have meaning in almost any situation one encounters. He posited that there is no universal “meaning of life.” Rather, meaning is something that you derive individually. It’s unique to you and your personal situation. The first avenue towards meaning is through creating or doing something – through a person’s work. A second way is by experiencing something or encountering someone – through God and through love. Finally, with the right attitude, we can find meaning in our suffering – not because of the suffering, but in spite of it. One of the problems people have, in his time as well as today, is what he called an “existential vacuum,” an experience of inner emptiness and void within themselves. I don’t know about you, but to me it feels like this is one of our greatest societal challenges today. A lot of us seem to be aimlessly wandering. We are searching for meaning, but don’t know where to start. It may account for the many of the horrors that happen today, from school shootings to the opioid crisis. 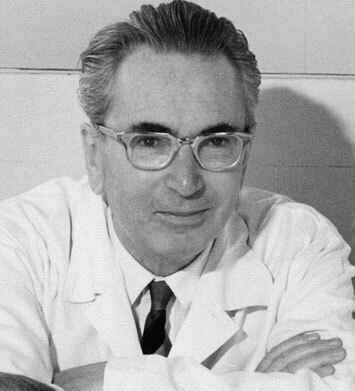 One area that Frankl believed people are either unable to find or lose their meaning is when they go through a period of unemployment. He believed that this stems from how we define joblessness, equating it with being useless and being useless is equated as having a meaningless life. Even in the late 1940s, when he first wrote his book, he worried that automation would lead to a significant increase in leisure time to the average worker. He worried many people won’t know what to do with their newfound free-time and view it as making their lives meaningless. However, with the patients he worked with, who were suffering through this situation, he would “prescribe” filling in their time with some sort of unpaid, but meaningful activity. When they followed through on his suggestion, their depression disappeared even though their economic situation hadn’t improved. While we can be taken care of by welfare to meet our basic needs for survival, it doesn’t adequately meet our other needs of having meaning and purpose. This is not only a problem for a person who is unemployed, however. So many of us simply hate our jobs or leave everyday dissatisfied. The work we are doing just isn’t filling that void. Many of us think we need a change of scenery – "maybe it’s just the company or my boss that I’m unhappy with." It could be. Or it could be the job isn’t doing it for us. If that’s the case, don’t just jump over the fence thinking the grass is going to be greener on the other side. Study it a little more to make sure the next move you make in your career is going to be a good one. So how do you find meaning in your work? Think about all the things that you’ve done in your life, from childhood on. What did you do that you got a lot of praise for? Are there things that people always come to you for help with? What sorts of projects does your boss assign to you all the time? What kinds of tasks are you naturally drawn toward? These are all good indicators of what your strengths and key skills (your talents) are. 2. 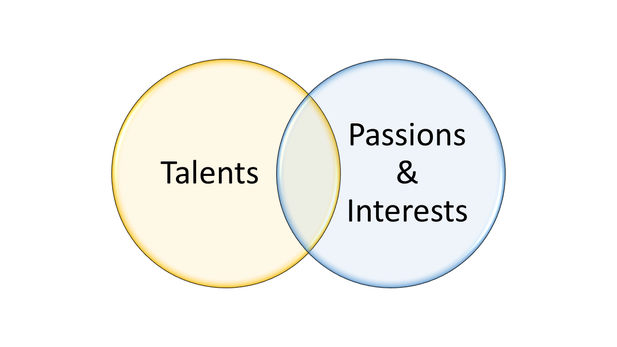 What are you extremely interested in or passionate about? What kinds of books do you like to read? What magazines are you subscribed to? What types of things are you inclined to volunteer for? What gets you excited to talk about or learn more about? Write it all down in Venn Diagram. In one circle you write everything in which you're talented. In the other circle you write down your interests and passions. 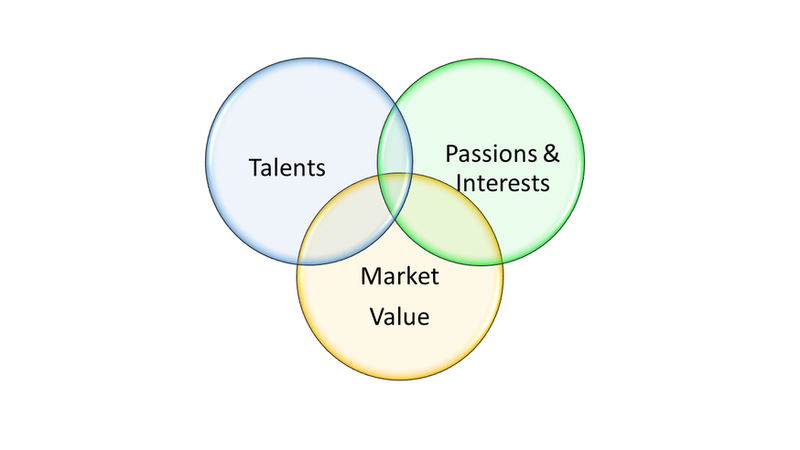 What you have in the middle is everything that you’re good at doing that you also have a passion or interest in. Here are the beginnings of a list of what is going to give you meaning in life. Now, what’s in the middle, your meaning, could be found in your work, but it might also be other areas in your life – your relationships, your religion, your hobbies and extracurricular activities, your volunteering, etc. To narrow it down better to work, you need to add a third question. 3. What does the market need and is willing to pay for? Even though you're really good at something and have an interest/passion for it, doesn’t mean that its going to be your future career. There has to be some demand for it. If there’s not, you might be able to still do it, but in another capacity, like a personal hobby. So, let’s add the third circle. If you only focus on one or two of the circles, disregarding the third, you’re going to have a hard go of it in your career. A person who only pursues a career because of money and who is reasonably good at doing it, but doesn’t really enjoy what their doing will soon find themselves in a mean case of burn-out and won’t find their career choice rewarding. For example, a person can earn a great living in the field of finance, but if you don’t have a genuine interest or passion in it, regardless of the salary, it won’t feel rewarding to you. At the end of the day, money isn’t everything. Likewise, you may have a great deal of passion for something that is in high demand, but without talent in it, you’re not going to do well. No amount of passion can make up for a lack of talent. Just ask the contestants who didn’t make the first cut in American Idol – all passion, no talent. Finally, if you have a special talent for something and really enjoy doing it, but there’s no market for it, you’re going to struggle financially. Sure, you’re great at calligraphy and love doing it, but if no one wants to pay for it, what you have is a hobby, not a career. Think deeply about who you are and what your purpose is. Then consider whether your career fits into this picture or if you can fulfill your meaning elsewhere. Then ask yourself what you can do that will give you more meaning at work – it may be finding another occupation or it could be finding something else to do where you are currently that will feel more fulfilling. Before you take any jump, do some research to make sure your next jump is the right one.